Trading is a very broad term, but the type of trading we're talking about today in No Man's Sky is the buying and selling of specific Trade Goods, that is their item type, and they are good for nothing except buying and selling, there is no other use in the game for these items. They fluctuate in price differently than other items with their prices being defined by special parameters as well as their availability. So let's cover the basics first. Every system has an Economy type. Each economy type sells 5 different items, and these items all sell for the highest price at a specific static economy type. This means that they create loops, of which there are 2 separate loops. The first is Advanced Materials, Scientific and Trading in that order which loops back round to Advanced Materials. The second is Power Generation, Mining, Manufacturing and Technology in that order which then loops back round to Power Generation. As far as which is more worth your focus, neither are any better or worse than each other on an overall statistics bases, the only difference that you may consider is that one is a 3 system loop while the other is a 4 system loop. Each of the 7 economy types has 4 names, this just adds a sort of fake variety to the galactic map and systems, while Alchemical, Material Fusion, Metal Processing and Ore Processing all sound like different things, they are all just Advanced Materials economy systems. While the systems information uses the list of 28 economy names, the Trade Goods themselves use the list of 7 economy type names, this can make it needlessly confusing in the beginning and is best countered by having a list of some sort on your phone while you play to reference when initially setting up trade routes. It's all more simple than you may first think, as that is all you need to know about economy types. Every system not only has an economy type but right next to it there are Buy & Sell percentages. These refer to Trade Goods only and more specifically to the trade good type defined by the Economy Type, so for example. If you are looking at a Scientific economy which on the galactic map will be named Experimental, Mathematical, Research or Scientific, the Buy percentage next to it will be referring to the reduction in price you are likely to get in that system when buying items there which will be items that are to be sold in a Trading economy type system. Still looking at the same system, the Sell percentage refers to the extra you are likely to gain by selling your items there, specifically your Scientific items as that is the economy type of that system, these items of which are gained in an Advanced Materials economy System. Now, these percentages are not exactly what you will find on the terminals within the system, it is more of an average or guide, kind of like a statistical view, yet you will only deal with the individual. That said, they are a very good guide and something you can trust. As far as extremes go, the maximum discount you will see specifically on this system-wide statistic is -40%, that is very extreme though and you should be quite happy if you find a -30%. For the Sell percentage, it is double in the opposite direction at 80% for the extreme maximum, but 75% is a super nice find. Your goal is to find systems that have the widest gap possible between the 2 percentages. And that covers the Buy & Sell rates on a system-wide scale, we'll delve deeper shortly, but first, the last part of the system-wide stats that you should take into consideration. Everyone knows about economy strength, namely Opulent and Affluent systems being the place to be due to the best ships showing up there as well as having the highest quantity of items for sale at terminals. But there is widespread confusion about the majority of economy strengths, and when you look into it, you realise that once again, this is far more simple than it appears. There are only 3 tiers of Economy strength, High, Medium and Low, there are a lot more High economy systems than most think because Opulent and Affluent are the highest, but they are just as high as the others in the High tier. Each of the 3 tiers has 8 different names. There is no need to think of each of these 24 as individuals in any way, just the 3 tiers. High systems have the classic highest chance of S Class ships and Freighters, medium with the lower chance and low with no chance (A single noted instance has been uncovered, though more with solid evidence is required in my opinion). High system space stations will have between 2500 and 5000 of the standard resources for sale like Plutonium, Heridium etc, whereas medium will have between 1000 and 2500 and low less than 1000. That product availability is what we're looking for, the high strength economies are the most likely to sell all 5 tiers of the Trade Good in that system and will sell the most amount of each out of the economy strengths. So when it comes to Economy strength when trading, you'll want to go for High economies wherever possible, medium if you really have to and never low, you won't even be able to buy enough to fill your max hauler. Now we know what to look for as far as the information displayed on a system, we'll compile that and add some logic for the route itself. First off, is the question of why you want to build an established route versus just winging it, and while you can trade well enough without an established route, you will make far less for your time, either settling for subpar systems to sell and buy your goods, or waste huge amounts of time looking for particularly good systems. By establishing a solid and static Trade Route, you and others can reap the rewards for a long time while only doing the hard searching once. For this, we'll assume we're building a Trade Route for the 3 Economy Type Loop, Advanced Materials, Scientific, Trading, then repeat. 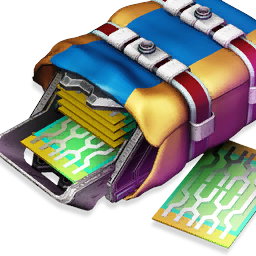 These loops are fully modular, it's a loop in the sense that the last economy type in the set of 3, which is trading, feeds into the first in the set which is advanced materials. You can have these routes be as long as you want, you are not required to do it in multiples of 3, or finish where you started, just stop by not buying in the system once you've sold. Where the logic comes in to play is the logistics of traversing your route with relative ease. I say this as guiding yourself through the galactic map for an extended quantity of systems is difficult and quickly becomes impossible for the scope of a human mind as the length of the route goes up. You could dial the systems for a custom waypoint, but that requires you to have a portal in every system discovered and marked. The absolute best method for this is to utilize the Discovery menu to just pop in and whack a new waypoint on the next system, 3 seconds and it's plotted from where you are. In order to make this viable, there are a few things you need to take into account. Firstly, the discovery menu orders the discoveries in a specific way, now I'm not 100% about which one of these it is, but either works for us here, I'm fairly certain that the Discovery menu orders the Discoveries by upload date, I'm quite sure that is the case, but it is possible that it order them by the date that you first discovered them, this is specifically regarding the systems you didn't first discover, if you did then it would be when you discovered not uploaded. Either way, we can utilize this by only making trade routes with systems we have never before visited, that no one has ever visited. If we then build the trade route all at once in one foul swoop, each system will be in order in your discoveries menu allowing you to just pop a custom waypoint on the next system up and travel there. To be extra safe and organised, we name the systems according to the route and number them. 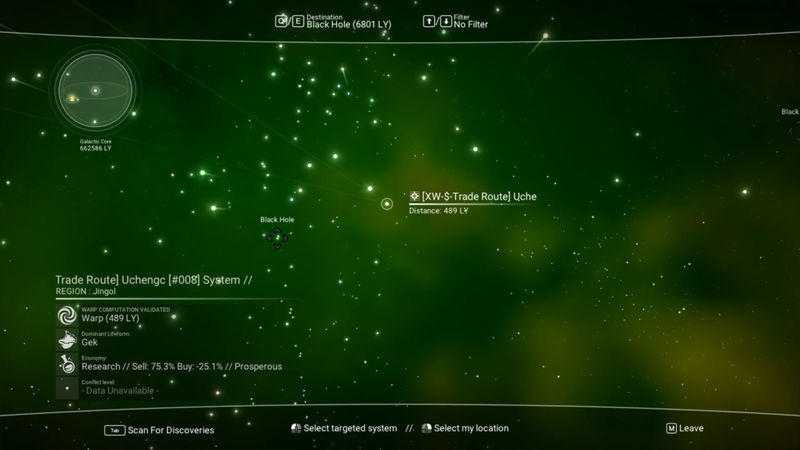 To make things even easier, more efficient and just quicker, we can decide to look for the next system when building the route base somewhat on travelling toward the centre of the galaxy, as the centre gives you a very easy landmark to quickly turn to and instantly spot your custom waypoint. With all that in mind, I moved out on the galactic map away from the hub toward the sun to find the first system in a region that is almost entirely undiscovered. I'm looking for Advanced Material Economy, with a low Buy percentage, as it is the first, the sell isn't an issue as this trade route will not return to the original and will be best to teleport from the final end. The system also needs to be a high economy strength system. Once found and renamed, off to find the next, which is a Scientific economy type system, with high sell and low buy percentages and a high strength economy, remember that Scientific is more of a tier and goes under 4 different names just like every other Economy type, so be sure to use a reference until you have it memorised. Rename that one, then head off to find a trading economy type system with a high sell, low buy percentages and a high economy strength. Rename that and repeat the process for as long as you want the route to be, though of course, it's only the first one where the sell isn't important and the last one where the buy isn't, all in between are important. Be sure that when picking your systems, you look for the planet number, as each system requires at least one planet that is not dead or weird, planets that are dead or weird do not have Trading Posts, and for maximum efficiency, it is best for the first planet in the system which is located closest to the space station and which you will be closest to when warping in, will be a living planet with Trading Posts. Now we've got the route itself fleshed out, it's time to look at the in system stuff as far as doing the actual buying and selling as well as the differences between planet, station, freighter and trader terminals. When it comes to the actual buying and selling of Trade Goods within the system, there are a few things to consider. First is the differences of where you buy & sell, as Space Stations offer a much worse deal than Trading Post Trade Terminals, meaning you should always buy and sell with Trading Posts, it takes a little extra time but we'll be setting up a way to do it faster. The way inner system economy works is that Space Stations are there own little pool separate from Planets and Freighters, they sell different things, prices are set differently and affect buy fluctuations separately. Freighters are also separate, and the list of goods available is specific to the freighter, not the location of the freighter like I previously assumed. Then there are Planet-side Trade Terminals, and while each planet-side trade terminal sells different things and different amounts of things, they all share the same behind the scenes stock levels, meaning that if you buy a Trade Good from one terminal then quickly fly to another terminal before it's had time to restock, that terminals stock levels will also have been affected. Traders that land at a space station have separate stock levels to the space station, but draw from the same pricing and potential stock available with their own separate quantities. Traders who land at a Trading terminal are the same except it is linked to the Planetside network, they don't affect the trade terminal stock levels or each other. Trader ships have 21 different models per system, I previously thought this was far higher, but these different models each have a different trading inventory, all Trader ships you see of a particular model will always have the same available inventory and stock levels but do not all share the same stock pool, meaning that if you buy 600 thamium from one model, other ships of the same model that land will not have had its stock reduced. Now when it comes to the maximum available stock for each individual Product which I'm fairly sure Trade Goods fall under Products, we can expect between 80 and 180 of each Trade Good in a High economy system. 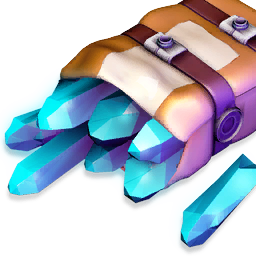 This not only means that with a fully trade ready max hauler, we cannot completely fill it with the top tier trading items, as a fully optimized trade hauler can have 43 slots for hauling cargo, which is 215 items, but it also gives us the time limit for a fully refreshed Trade Route, as Products take 60 seconds per item sold or bought to recover both it's stock and pricing. 180 minutes is 3 hours. So for continuous trading, your Trade Route must take at least 3 hours to complete. Price change on Trade Goods specifically occurs on a per item sold basis, in the system where it is produced the price is changed by 0.33% and in a system where the items are required, the price is changed by 0.25%. The price change takes effect on sale and not when exiting the terminal menu, so you should always buy the full amount of an item in one go as well as sell all of a particular item in one go to get the best prices. 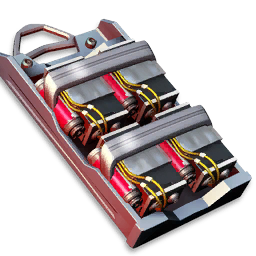 If for any reason, you have the same item split over your exosuit and ship, you would likely be better off selling the larger amount at the Trading Post and the smaller amount at the Space station or to a trader that lands to not suffer from potentially huge price drops. Also, Trader ships that land are not affected by the price drop on the terminal at the Post it lands at. There are 5 tiers of Trade Goods. All of these prices are based on the Galactic Average and not the base value. 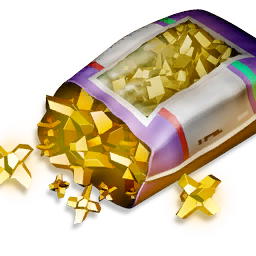 What holds you back in trading is Cargo space, so you will want to purchase the Tier 1 items first, the highest amount of these you would be able to obtain is 180 due to that being the maximum possible stock level for tier 1. 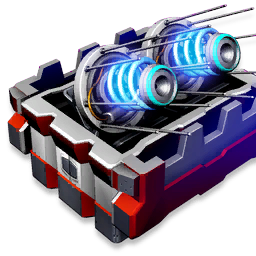 After that if you are using the maximum space available in a starship of 43 slots or 215 items, you will have 35 items worth of space remaining, now you could either fill this with Tier 2, or, you could use that space to store your warp cells for travelling the Trade Route and then place up to 170 tier 2 items in your Exosuit's main & cargo, which are linked, so this will only count as a single transaction. The space in your Exosuit may be a little less available if you have an extended route and while building warp cells in bulk is the most efficient, planning a fuel stop to bulk build 35 Warp cells every 35 systems isn't a bad idea, it will help spread out the time a little for the continuous trade route version and could be a good time to also plan a 5 minute break or something while keeping as close to maximum efficiency within the trade route. As you get closer to your fuel stop you could pad the extra space in your ship with Tier 3 to make a little extra for no extra effort. On the basis of 180 tier 1 and 170 Tier 2 with a scratch build of 35 warp cell to start, assuming you built the Warp Cells starting with buying suspension fluid and a 15% minimum reduction in cost from your first system in the route, you will need a primary fund of roughly 13 Million Units. Which if you have full exosuit and cargo slots as well as a 48 slot hauler, is hardly worth worrying about. Now that you have setup your Trade Route within the Galactic Scale, it is time to set up each system for maximum efficiency, this is extremely simple but will take a small initial time investment per system. All you are going to do is use your economy scanner, which if you do not have will add significant time to this step, and scan for a trading post on the first planet in the system providing it is not dead or weird, if it is, then do this on the closest planet that has trading posts. Go to the Trading Post and check the availability (Price isn't so significant of a value as the availability at this point), the Tiers will differ dramatically in percentages from the galactic average, but it is always more beneficial to get the highest tier. 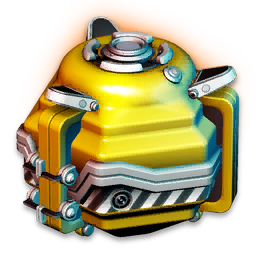 Once you find one with at least 150 or more of both tier 1 and tier 2 and a half decent percentage, mark it with a beacon and if you are planning a route to help others also, mark it with a comms station, others can't see you beacons and you can't see your own comms, it's a tiny amount of iron, so well worth the slight extra effort. Continue doing this for the whole Trade Route and you will have cut a huge amount of time from your route and increased profits significantly. Of course, this kind of guide would not be complete without a solid real-world test to iron out any miscalculations from the theorycrafting and just get some solid data as evidence. For this test I made a 10 system Trade Route just outside the Galactic Hub, it is fully made for everyone to use. I first selected the systems, I found the first 800 or so Light Years away from the Galactic Hub and checked the area around the first 2 systems to ensure I was not encroaching upon any civilized space as my naming convention for the route would not be welcome there. For the First system I looked for all 3 of the Economy Types in this loop, which are Advanced Materials, Scientific & Trading as it didn't matter which one I started with, it just so happened the first good system to fit the mold was an Advanced Materials one. I also paid no attention to the Sell, only the buy as for the starting system only Buy was important as I had no intentions of looping back around. Using the Economy filter on the Galactic Map is a godsend here, it allows you to see each system as the colour for the economy type, Advanced Materials is Purple, Scientific is Dark Blue and Trading is Green. After a few minutes, your eyes fully adjust and it becomes incredibly quick to check systems. Of course, without the Economy Scanner, you cannot create a trade route without previous scouting on a very large scale. Checking systems of the correct colour I first looked at the economy strength, on the rare ocassion I found a high economy type I then checked the Sell and Buy percentages, If the buy and the sell added together was around 90 to 100 or more I would either place a custom waypoint if it was on the low end of that or just warp to it if it was on the high end, I also aimed in the general direction of the center of the galaxy in order to make it viable to navigate the Route without placing custom waypoints to find each system. Once in the system, I just scanned to ensure a trading post was present somewhere in the system, changed the name to fit my convention and moved on to the next system, always recording the distance between each system and never exceeding 700 Light Years, my rule was never more than 800 to allow for the majority of players to be able to use it. The lowest is 69 with the highest being 679. This also allows for the system to be visible quickly via just the circle around it, which is a sign that you have visited there before. This is the main reason I would suggest you make this in a place you have never travelled. Once I had reached 10 systems, I started working my way back to prime them by searching numerous Trading Posts per system, unfortunately, you cannot cycle through the trading posts with the scanner, you must visit the post to dismiss the waypoint no matter where it is, I would suggest going very close to the planet surface on the side of the planet where the space station resides and scanning from there, moving back to around that location each time you do another scan, but if you find a trading post with a high quantity of Tier 1 and Tier 2 products that is a minute or 2 pulse away, I would say this is worth it, but only if very high or the only option. In the Trading Posts, I would settle for 150 of each or more, focusing mainly on Tier 1, in a single system after many many trading posts I did settle for one in the 140's for both. Once I had found an acceptable trading post, I placed a beacon for myself to locate easily, and then a Comms station for other to locate it. I also changed the name of that planet only, to match the convention with the trade route stop number in case it was not the first planet, so players can scan the planets to see which is named as such and then enter the atmosphere to bring up the comm station way-point. For any who are interested, shortly after I started priming the systems I streamed it with the full test at the end. The whole process of setting up these 10 systems which would afford 9 full transactions took approximately 5 hours, I believe I could do it in 3 to 3 and a half had I not streamed it. This is a significant time investment, but worth it if the system was profitable. The more time you put into this will give you higher rewards, there is a point where you will face diminishing returns of course, but the longer you hunt for better systems and the more trading posts you check, the higher the profits will rise. If the timestamped link isn’t working the Test begins at 1 Hour, 54 Minutes and 49 Seconds. This test was performed casually yet with no messing about in order to best replicate the average user. The test results surprised me massively. A fully optimized Trade Route is in another world in comparison to just casual trading. My test lasted 29 minutes and 20 seconds, the time was taken from the moment I clicked to warp into the first system until the moment I clicked another system after the 10th. This earned a total of 71,161,015 units, which is pretty damn high, this equates to more than 145.5 million units an hour, not only that but 2 things need to be accounted for that will make this far more impressive. The first is one of the systems I primed. In my fatigued stupor, I settled for a singular Galactic Trade terminal out in the open that is not at a Trading Post, when it came to performing the test I realised I cannot sell from or buy to my ship from such a terminal which cost me multiple minutes to transfer items back and forth singularly. If you take this into account and remove that time, not even removing the extra time for faffing about with other things later because of it, the time drops from 29 minutes and 20 seconds to 26 minutes and 10 seconds, which is more than a 10% drop. Then account for the losses made due to selling that particular lot in more than one go due to the exosuit not holding the full amount the ship did. You get the correct amount for such a Trade Route which is 71,658,473 for 26 minutes and 10 seconds work, which per hour equates to 164,354,296. Even then, it is less than it should be, as if you are going to multiply the route, you must first take the 1 minute 40 added on by the last system as you don't go into the route with anything to sell and don't leave with anything to sell, so that's 10 systems time for 9 transactions, if you were to take this to the max then you would take that 1 minute and 40 off, multiply the route then add it back at the end. This research and testing has shown me that Trade Routes when properly optimized and setup can reward very close to the Ultimate Farm, the Stasis Device farm which requires far more time and resources to set up. With maximised optimization and a full 3 hours long route for continuous trading, I think this could hit the 200 million per hour mark. You are, of course, using warp cells and iron while travelling the route, but compared to the profits they are insignificant and the Stasis Device even requires more to run also with Plutonium, Heridium and more being purchased en mass. 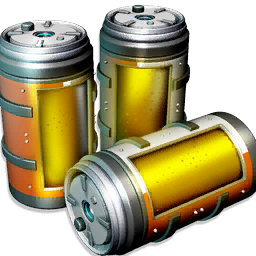 Don't forget, using space stations and trading posts in high economy systems you can build Warp Cells in bulk easily making 100 in less than 10 minutes with hardly any effort. If we take the time this Route took then remove the 1 minute 40 we get 1470 seconds, 3 hours is 10800 seconds, minus the 100 seconds and then divided by the route time we get 7.279. This is how much we multiply for a solid 3 hour figure, but of course you can't half part of a system, so, 7.279 multiplied by 9, to get the total systems in that Trade Route, which is 65.511, so we need to round that up to 66 and account for the extra time later. So 66 systems, with an average of 163.3 recurring seconds per system, leads us to 10,780 seconds for 66 systems, we then add the 100 back on for the end system for 10880, the extra 80 second ensures we have run the 3 hours for all prices and quantities to be fully reset. If realistically doing this I would push it to 70 systems to ensure even the speediest space beast is accounted for, you would also need to take into account warp time which is a time where timers for such things as pricing and quantities do not tick, but that does not really impact what we're doing in this theory-crafting style exercise, as we aren't looking at the continuation. For this, we should use the same method for the per system average profit, so 71,658,473 divided by 9 gives us an average profit per system of 7,962,052.5 recurring and a total profit for the slightly more than 3-hour route of 525,495,468.6 recurring. so if we take that off the final total, and divide by 3, we get 173,877,177 units per hour. Not crazy different, but it's pretty cool, and yes I know, a 10 system test is hardly a super accurate representation of the average, but it's a pretty damn good guide of what can realistically be achieved, and this whole experiment proves just how valid Trading is when done right. So to finally answer the question, is trading worth it?.. yes, yes it really is if done in a static way, it is far more profitable than any farm other than Stasis Device and Fusion Ignitor and requires far less work to set up. 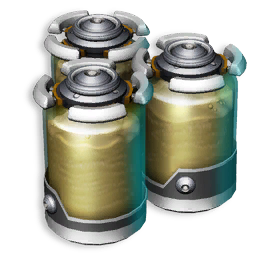 If you are someone using the Trade Route or any Trade Route that someone else has set up and been nice enough to mark with comms for you, I would advise that you take as many voltaic cells with you as there are systems, then on your first go, plant a Beacon at each Trading Post, enabling you to shave a lot of time off your future Trading as beacons will be seen from anywhere in the system whereas comms require entering the atmosphere to appear. And for those setting up a Trade Route, you should place a comms with your beacon, as while it's of no use to you, it costs 20 iron and takes a few seconds, it'll help out those who follow. Also, a quick tip, when I first started mapping the systems, I wasn't saving and the game crashed losing all of my progress, this is a very demoralizing thing, so, when mapping the systems, I would suggest flying directly in the station, let it save the game, then rename the system, this allows you to reload if you mess up naming the system, then save once more for good measure and carry on as it can take a while to find some systems, so save between each one. This was an incredibly long one folks, I had no idea how big of a subject this would be when I embarked upon it. It took a lot of work so sharing with your No Man's Sky buddies would be super appreciated, it would be great. We have a Discord and a Patreon, support is always massively appreciated. I'd also like to give a shout out to all those who have helped with bits of info and general discussion when I started looking into this as well as Ket for not blocking me and instead providing solid information and mostly SeansCheckShirt, a Reddit user who wrote the most well presented and well researched information on everything to do with Economies in No Man's Sky that I have ever seen, it's been huge in confirming or denying and providing information I had no clue about. Have an awesome day folks!